Very Good. 0099556316 enscription on first page. Good. Fast Dispatch. Expedited UK Delivery Available. Excellent Customer Service. Tanned at page edges. My wife and I listened to it on cd while driving. I was so cool, I bought the book for my Dad. He was a navigator in the Korean war and really enjoyed all the info about airplanes. Great book. Crichon spanned such broad topics, yet wrote about each one with precision and accuracy. As the daughter of a pilot and crash scene investigator, Airframe hit it home for me. The detailed explanations and examinations were well written. The storyline itself is excellent, There's a mix of mystery, conspiracy and cover-ups. It's a perfect balance that keeps you reading. 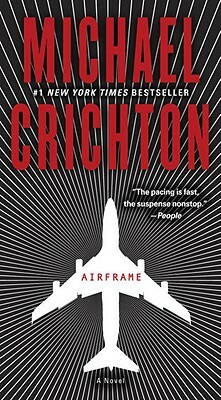 Even though the "dinasaur" books recieved such attention, I feel that this is one of Crichton's best books. The title is really a pun meaning both the "frame" on an airplane, and the "frame" of false accusations that a reporter tries to hang around the neck of the aviation industry. The story is engrossing, both for the way that the reader learns a lot about how airplanes are put together, and the cheap way in which the media sometimes represents the aviation industry.